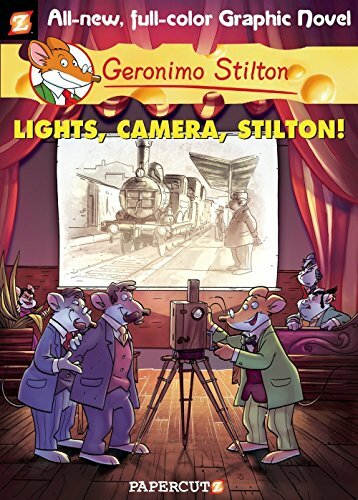 a book review by Renee Hand: Geronimo Stilton Graphic Novels #16: Lights, Camera, Stilton! Geronimo fans will love reading the 56-page graphic novel Lights, Camera, Stilton! though fans of the books will find some differences between reading Geronimo Stilton graphic novels and the Geronimo Stilton books. In the graphic novels many things carry over from one graphic novel to the next so if the reader didn’t read the other graphic novels they might miss some of the references implied. In the graphic novels there seems to be a different tone that is portrayed from Geronimo. In the books he can be funny and silly, with the plot adventurous or mysterious in some way. In the graphic novels the tone is definitely more serious, though adventure or mystery is central and wrapped around a historical event, and of course the characters look a little different.